Building a 1/96-scale card model of the English frigate HMS Mercury from a kit by ShipYard of Poland. This is my second paper ship model. Before I can put too much of the interior detail into place, I really need to add the cannon carriages and probably the gun tackle too. The main reason is that if I am going to add any amount of gun tackle, I need some room to add ringbolts and blocks and such in the tight confines of the model’s interior. This will be more difficult if I try to do this after adding other interior furnishings. This entry was posted in Card Models, HMS Mercury, Ship Model Build Logs and tagged English 6th Rate Frigate, Paper Model, Ship Model Kit, Shipyard on October 28, 2017 by catopower. 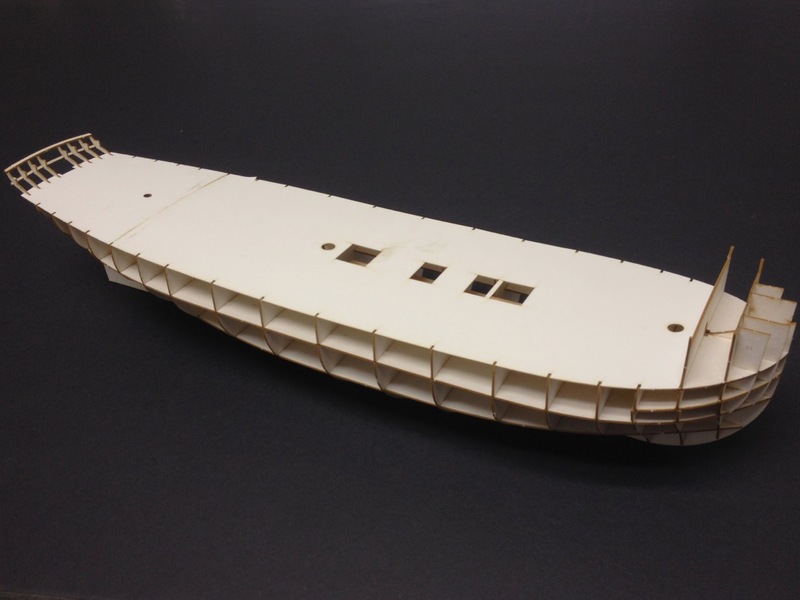 The 1/96-scale HMS Mercury paper model continues. Since my last posting on the subject, I’ve been considering posting a little more regularly to the build logs on this site. I’ve traditionally posted in more regularly on major ship modeling forums and posted larger summaries here. But, for various reasons, I think it makes more sense for me to post more details here. Having some interior detail is one of the interesting aspects of these Shipyard brand kits. I don’t know if I’ll be using all of the interior furnishings, but certainly want to include the major ones, even though these will be extremely difficult to ever see inside the completed model. I built the stove straight from the kit, with a few modifications. I don’t know how the stoves external gear functions, but there is a what looks like a chain driven mechanism, apparently for turning a spit. The chain drive was printed on paper, two gears and the connecting chain, and it was just too hard to cut out as a single piece. So, instead, I cut the gears out and then just added wire to represent the chain. I also used a heavier piece of wire for the external axle. This entry was posted in Card Models, HMS Mercury, Ship Model Build Logs and tagged English 6th Rate Frigate, Paper Model, Ship Model Kit, Shipyard on October 21, 2017 by catopower. To begin with, I have to revise something I stated earlier about card modeling being challenging. 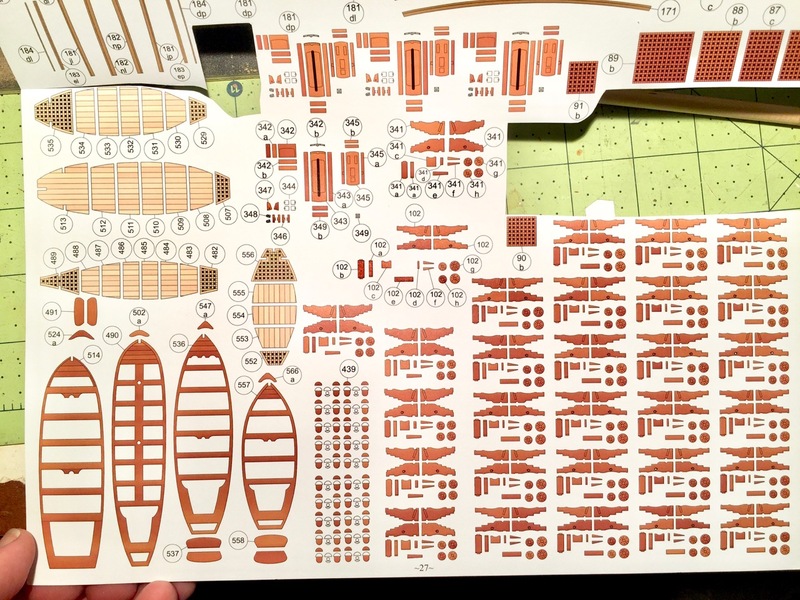 The biggest challenge about these Shipyard paper model kits is a mental one. When you get one of these kits, you instantly see a gazillion parts, and you have to cut out each and every one, plus you might decided to cut out windows instead of using printed windows, etc. That’s intimidating. So, I’m finding that approaching construction of one of these kits is a lot like tying ratlines on a ship model. You can’t think about all those knots you have to tie – you just have to start and do one at a time until you get to the end. Building this model is about baby steps. You can’t count how many baby steps you have to take, you just have to take them one at a time and keep on going. First off, I glued the new pieces into place in the fo’csle and then added the doors back on. If you recall, I’d added the doors earlier and then decided I didn’t like printed windows. So, I removed them and the related partitions and cut out the window panes and used canopy glue to add the “glass”. In addition to the doors, I also finished the inner bulwarks pieces at the bow. As you can see in the photo below, I still have to “edge” the gun port sills with red paint. This entry was posted in Card Models, HMS Mercury, Ship Model Build Logs and tagged English 6th Rate Frigate, Paper Model, Ship Model Kit, Shipyard on July 1, 2017 by catopower. Since I’ve been on the subject of paper ship models anyway, I wanted to give some attention to the German card model forum Kartonbau.de. Now, it is a German site, and the forum entries I looked at were all in German. However, you can connect to it through Google Translate and that seems to work very well. 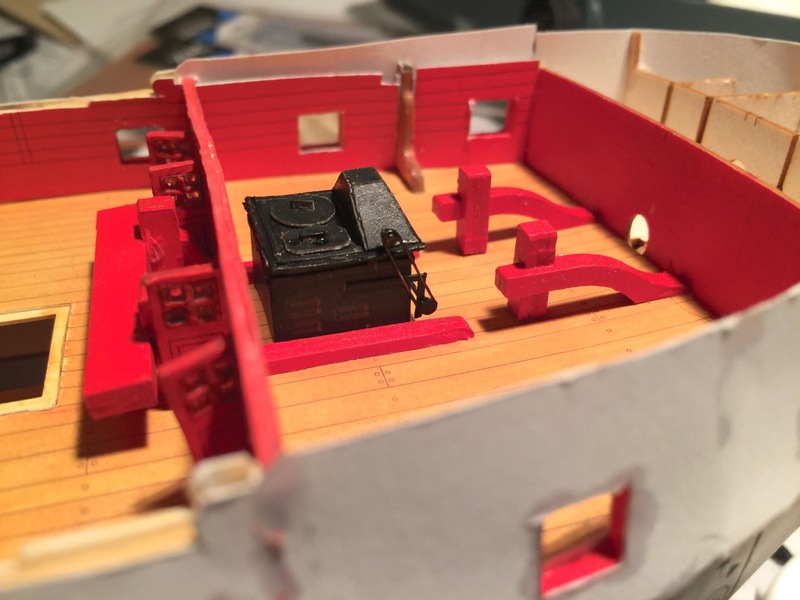 On the forum, I ran across a build of the same HMS Mercury kit that I have been working on, a 1/96-scale model from Shipyard. However, there is a world of difference between the German builders model and my own. It’s very inspiring, but it is also making me take a second look at my build and making me think I need to go back to square one! 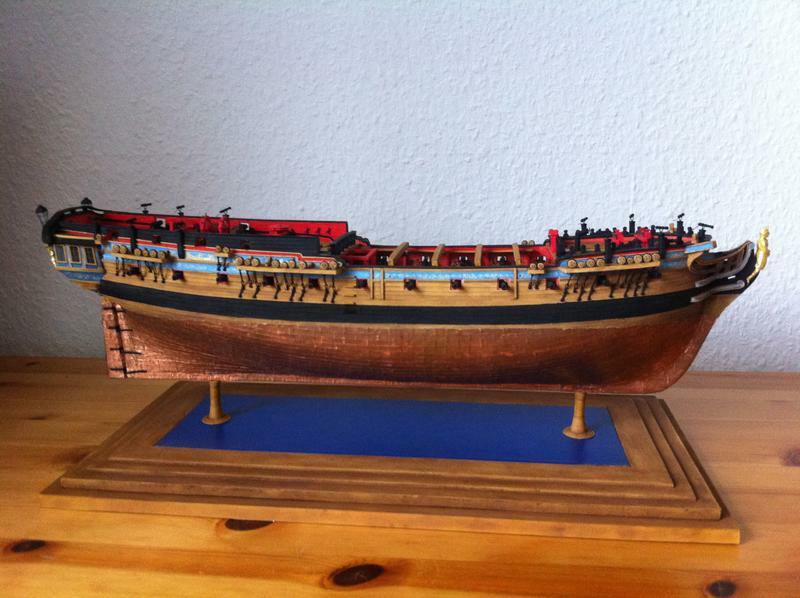 This entry was posted in Card Models, HMS Mercury, Ship Model Techniques and tagged kartonmodel.de, Shipyard on June 27, 2017 by catopower. I’m not a paper/card modeler, but after building Shipyard’s paper model of HMS Alert, I enjoyed the project so much that I tinkered with a couple other subjects. I have two of them at the moment, and like with my ship modeling scratch build projects, I start on a few different ones until one of them stands out and calls to me to be taken to completion. That’s actually how HMS Alert came to be. 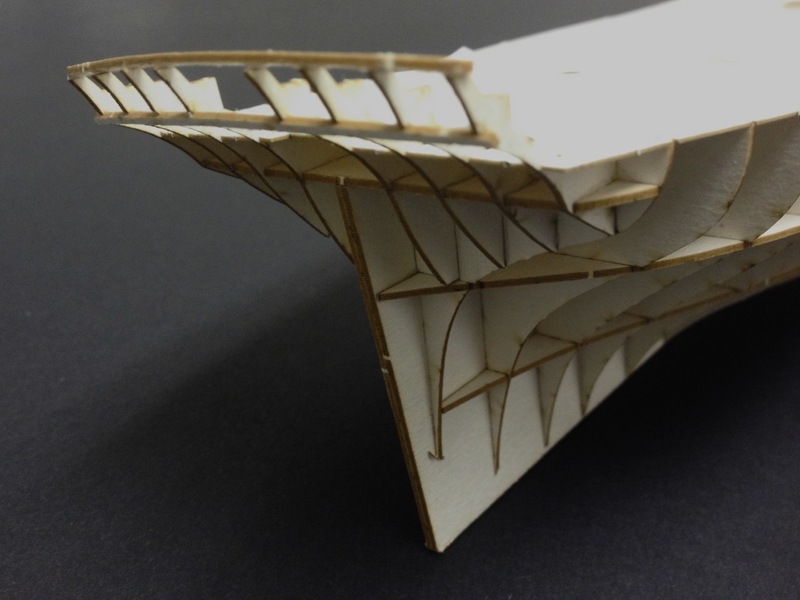 I had no particular plans to complete the model initially – it was just a tinkering project. 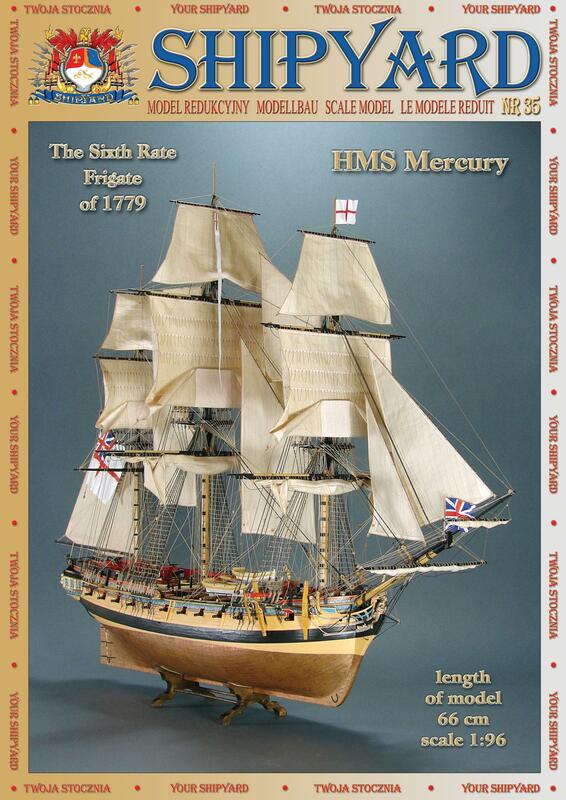 Now, one of my current paper model tinkering projects is Shipyard’s 1/96-scale HMS Mercury paper model kit. The ship is a 28-gun Enterprize-class sixth-rate frigate. As I mentioned before, there is a 1/72-scale boxed version where all the parts are laser-cut instead of printed, but that kit is around $500. Mine is about $35 at the North American distributor for Shipyard products, Ages of Sail. This entry was posted in Card Models, HMS Mercury, Ship Model Build Logs and tagged English 6th Rate Frigate, Paper Model, Ship Model Kit, Shipyard on June 18, 2017 by catopower. I’m not the only one with an HMS Mercury paper model in progress. Here’s one based on the 1/72-scale boxed edition kits in Shipyard’s Laser Cardboard Kit series. This is a really nice kit, and I’d love to work on one of them. The HMS Mercury is Shipyard’s flagship product. Take a look at the pictures of this builder’s project. Seeing these gave me some inspiration to make some progress on my own HMS Mercury. Wooden ship model builders, I’m telling you that you should look at trying one of these kits. They are challenging, but really rewarding to build. This past weekend, we had a vendor table at the IPMS show in San Jose, and had a chance to talk to many people, including a number of customers. 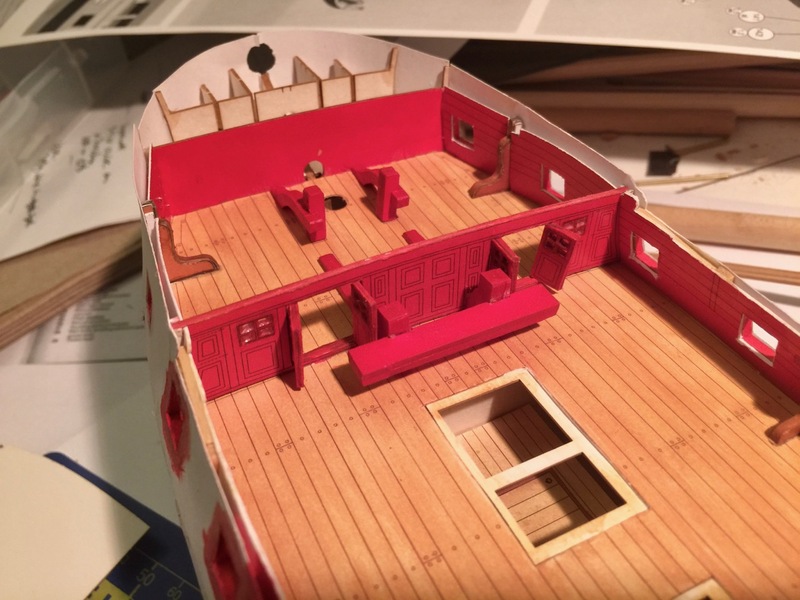 One of them, Ron Palma, is building a 1/72-scale model of the British sixth-rate frigate HMS Mercury from Shipyards Laser Cardboard Kit series. Yesterday, he sent along some progress photos and said that we could share them, which we are very excited to do! Ron has the hull mostly completed and copper sheathed. Keep in mind that while the frieze work is included in the kit, the whole model does not come pre-printed. So, the excellent paint job is Ron’s handiwork. He commented that the cannon barrels have been taped to protect them from the clear-coat overspray he gave the hull. This entry was posted in Card Models, HMS Mercury, Ship Modeling News and tagged Paper Models, Shipyard on March 8, 2017 by catopower. Having completed Shipyard’s HMS Alert kit, it just didn’t feel right to not have a paper model to work on. There’s something about the simplicity of paper that is just too darned cool! Of course, I have plenty of wooden ship model projects, but it’s nice to have a paper model going in the background. As with other background projects I’ve had in the past, there is no rush to get it done. There’s also nothing that says I have to ever get it done. But, having completed the Alert, I can see taking on another kit and carrying it to completion. Now, I have Shipyard’s Super Modellar Plans (that’s Shipyard’s spelling, by the way, not mine) for the Santa Leocadia, a Spanish 38-gun frigate in 1/72 scale. The “Super” part of that title means that the plans include the laser-cut frames and some other items to give you a start on the model. However, beyond that, it’s really designed as a scratch build project. That’s something that, as a wooden ship modeler, I can probably do. But, I’m really not looking for something that requires a great deal of thought and planning time. I’d rather just go with a kit that I can just follow along and build. There are the “Laser Cardboard Series” of ship model kits, which are boxed sets and include cast resin figurehead and scrollwork, turned brass cannons, wooden dowels for masts, pre-cut sail cloth, etc. Those kits are really nice and are in a larger 1/72 scale. However, I already have a paper model kit on hand that I bought more than a year ago. It is Shipyard’s 1/96 scale HMS Mercury kit. This entry was posted in Card Models, HMS Mercury, Kit Reviews, Ship Model Build Logs and tagged English 6th Rate Frigate, Paper Model, Ship Model Kit, Shipyard on August 8, 2016 by catopower. What Does a Ship Modeling Fool Do When Out of Town? This past weekend, I was away in my old hometown, a place where I didn’t have a whole lot to do one day. Knowing this would probably be the case, I brought a couple easy to transport things to keep me occupied. Some people would just bring a book or watch TV. Me, I’m a ship modeling fool, so I brought a couple new ship model projects along. One was an unstarted paper model kit, a 1/96-scale model of the British frigate HMS Mercury, by Shipyard of Poland. The other was the Mini-Yakatabune kit from Woody Joe of Japan. While the HMS Mercury kit is a major project, I figured getting the framework together would give me something to show at an upcoming ship model meeting. Also, last year I had a paper model of the British cutter HMS Alert that I took with me to the Nautical Research Guild Conference. I was working at the Ages of Sail table in the Vendor Room and the partially completed model made for a good display of these kits. The next conference is coming up in another 6 weeks or so, and I’m working the Ages of Sail table again. I thought it might be good to take a different started kit. I considered taking the HMS Alert, with is much farther along, but I’ve put a lot of work into it and don’t want it to get damaged in the trip. Bear in mind that this is the 1/96-scale Paper Model kit and not the 1/72-scale Laser Cardboard Series kit. It was fun to get a paper model started, especially since all the frames and sub-deck pieces all pre-cut. So, as far as I got, it was all just cut and slip parts together. I didn’t actually spend a lot of time on it. But then, this was actually project number two, which I didn’t work on until I was done working on project one. The first project, Woody Joe’s Mini-Yakatabune kit, was something I received a couple months from the Japanese online dealer Zootoyz.jp. 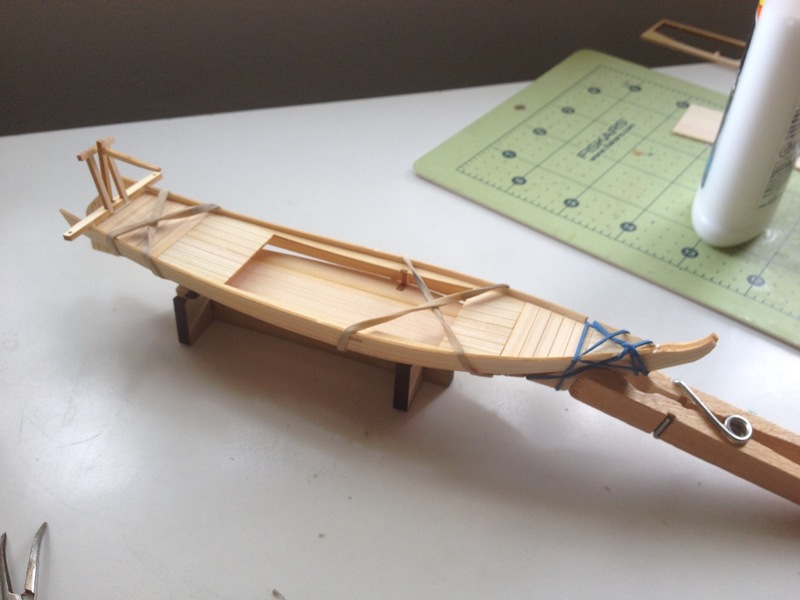 I’ve been working on the large Yakatabune kit from Woody Joe, so I was already familiar with the craft. While I’d been working on the larger model, I’ve been writing about it on Model Ship World. Meanwhile, a fellow ship modeler has been working the mini-kit. Since I had the unstarted kit on the shelf and was very impressed by the work that the other ship modeler had done on his model, I took the kit along with me. Woody Joe product listings suggest it’s an 8-hour build, so I put that to the test. I came away from the weekend with everything on my list done, and also managed to pretty well finish up the Mini-Yakatabune. I’ll post more info on that kit later. But, I will say for now that I built it in a day – pretty close to the 8-hour suggested build time. I’ve built Woody Joe’s Hobikisen mini-kit and also have an unbuilt Utasebune mini-kit on the shelf too. But, from my experience, the Mini-Yakatabune is a great kit with lots to do and it looks really nice when it’s all done. It’s more expensive that the other mini-kits, but has a lot more laser cut parts than the other mini-kits. I highly recommend building it! It’s such a neat model and the subject seems culturally significant, so I personally think the completed model will make a great gift. I’m going to give this one to my shamisen teacher and even went so far as to order a couple more of them to build for my former taiko teacher. With a list price of 5500 yen, about $46 at the time of this writing, building this kit as a gift shouldn’t break the bank account. 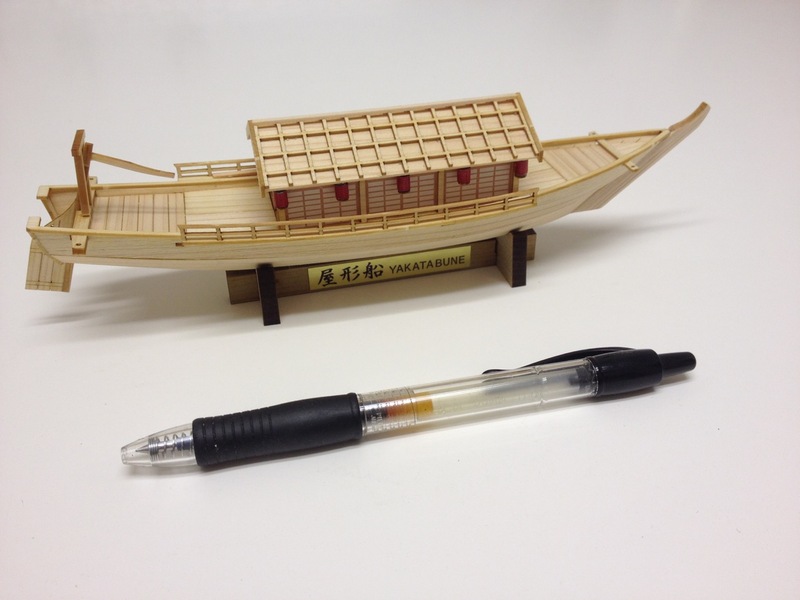 This entry was posted in HMS Mercury, Mini-Yakatabune Build, My General Blog, Ship Model Build Logs, Ship Modeling News and tagged Shipyard, Woody Joe, Yakatabune on September 14, 2015 by catopower.